You are here: Home / Sustainable Living / Want Gourmet Ingredients Right At Your Fingertips? Grow These 10 Easy But Oh-So-Delicious Herbs! Have you ever moved to a new home and realized you didn’t quite know what you were getting into? That’s what happened when we moved to our farm. We were very used to easy sources for herbs, creme fraiche, and other yummy ingredients. Buuuuttt…good luck finding them in a 50 mile radius in this rural town. In fact, part of the reason we started our homestead was so we could have access to fresh, organic ingredients that otherwise we would have zero access to (or at least ingredients that hadn’t been sprayed with a ton of Round-up or shipped from questionable sources overseas) – herbs included. 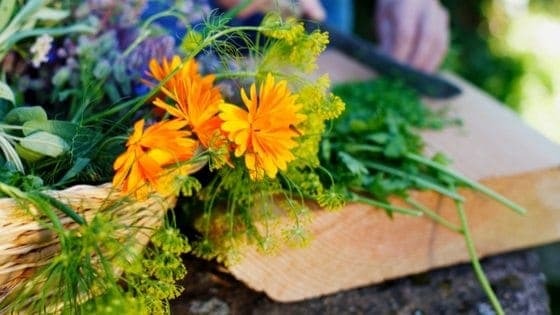 If you’ve found yourself in a similar situation, or just want to bring the garden indoors, here’s 10 easy, versatile, and gourmet herbs we’ve had success with! You can grow them in your own kitchen, and they’ll have your friends convinced you’re either a green-thumb savant and/or Gordon Ramsay himself. You can grow basil as an annual herb. For classic and aromatic flavor; you can try Genovese Basil. Grow Lemon Basil for a citrus flavor and Spicy Globe if you’ll like a Basil herb that grows compactly (8 to 10 inches tall). Spicy Globe basil looks great in pots. Plant in at least a 6-inch pot, keep watered, and fertilize with compost once a month. Ready to harvest when the plant is 6-inches tall, well established, and consistently growing leaves. Easy pesto anyone? Although this initially grows very slowly, with enough patience, it will eventually form a bush or small tree which you can easily train into a wide array of shapes, or even a topiary. To make it easy start, you can purchase a young, organic, 1- to 2-foot plant and begin nurturing it. Perfect for soups and stews. Also known as French parsley, this annual herb shares a striking similarity to delicate overtones of anise in terms of appearance and taste. Water regularly, and feed compost every other month. To harvest Chervil, all you need to do is snip the outer leaves and stems. This is a grass-like herb with a mild onion flavor. Perfect on baked potatoes, or whenever you need a delicate, fresh, onion flavor. When harvesting, it is highly important to cut small bunches of leaves back into the soil level in order to keep new ones growing constantly. Plant in a deep pot because Cilantro has a long taproot, and needs room to grow. It’s best to plant is where you intend to keep it because it doesn’t do well with transplanting. Keep in a sunny area since it loves warmth, and water regularly. Dill is an aromatic annual herb which is best known for its leaves when it is grown indoors. You can also grow it for its seeds – if you’re able to stop yourself from eating it! Add to soups and curries, or with fish. Fernleaf dill is a compact herb which is perfect for indoor growth. This herb originates from the Mediterranean and it is a member of the oregano family. However it stands out from other members of its botanical family in terms of flavor, which is distinctly sweeter and more delicate. Sweet marjoram can be grown in pots on a sunny kitchen window sill. Plant in a 6-inch pot, and water regularly. Peppermint and spearmint are both awesome choices for your kitchen. You can harvest it for tea or as flavoring in a salad. It’s hardy and easy to grow as long as it gets water regularly (if the soil is dry below the surface, it’s time to water.) If growing outdoors, you should ensure to put mint in its own personal container as it can easily outgrow and choke other herbs. When the plant is young but established, snip off new growth to encourage the plant to spread and develop more stems. There’s a few different types of oregano. For one that packs a lot of flavor, Greek oregano can grow up to about 12 inches in pots (plant in a 6 to 8-inch pot for best results). Ensure to harvest oregano leaves regularly in order to encourage the growth of new ones. Both Italian flat-leaf and curly-leaf parsley grow effectively when put indoors. When harvesting, ensure that you cut off the outer leaves. Doing this will spur the growth of new leaves from its center and will keep it productive for a long period of time, possibly several months. Do you have a favorite herb to grow in your kitchen? Leave a comment below!